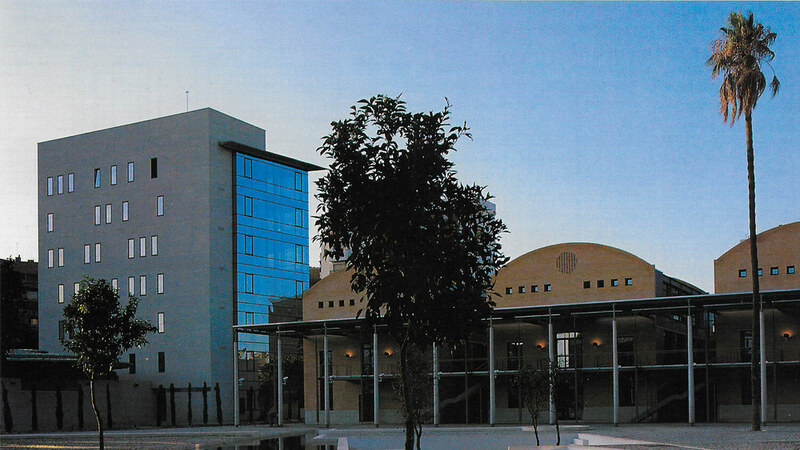 The Agriculture and Fisheries Council is located in the antique "Fábrica de la Comisaría Algodonera del Estado" (Seville). The structure of the buildings consists of metal supports and composite beams mainly. The beams of the main load frames are Vierendeel type, that have been composed by two chords and vertical struts, made of H-cross-sections. The lower flange of the upper chord coincides with the lower bound slab. The joists have been supported on it and the concrete slab over the metal beam collaborates with the compression chord of the latter, performing the composite action. The beams are embedded in the piers thus constituting the rigid frames. The slabs are made of reinforced concrete joists and solid endings collaborating with the steel beams. On the roof, a reinforced concrete slab over the steel supports has been adopted. Crosswise to the main frames, there are steel beams supporting the enclosure walls and bracings the frames. Besides, a cyllindrical building destined to library has been projected. Its main feature is the absence of inner piers. The roof is supported only on its perimeter, and is formed by radial metal beams. These beams are divided in two parts; a solid-wall beam at the beginning and a truss one near the central connecting ring. In addition, a tie-supported metallic canopy has been designed. Each one of these ties reachs the upper side of a steel mast and is anchored to the floor afterwards. Due to practical reasons, the tie is divided in two straight segments hinged together to the mast head. Only one of these is required to be tensed.